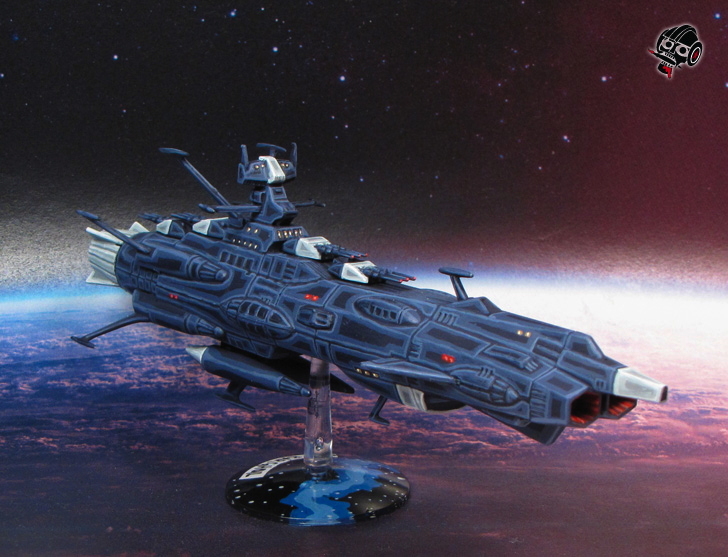 First of three frigate-sized ships. Pretty small in relation to the bigger ships, but it will fill out the fleet well enough. I have three of these ships. 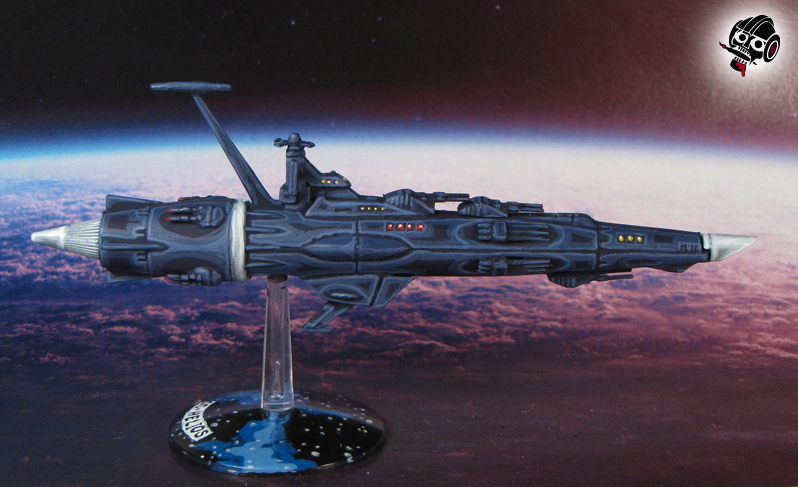 The final of the three frigate that I painted. These ships are torpedo boats in the Star Blazers world, but I will likely give them all kinds of roles in the Full Thrust action. The three ships together, just to prove the previous three shots weren't three pictures of the same ship! A view from the back of the ship. This ship is technically the battleship Andromeda, but I've named it the Barghoil, which was inspired by some anime space ships... 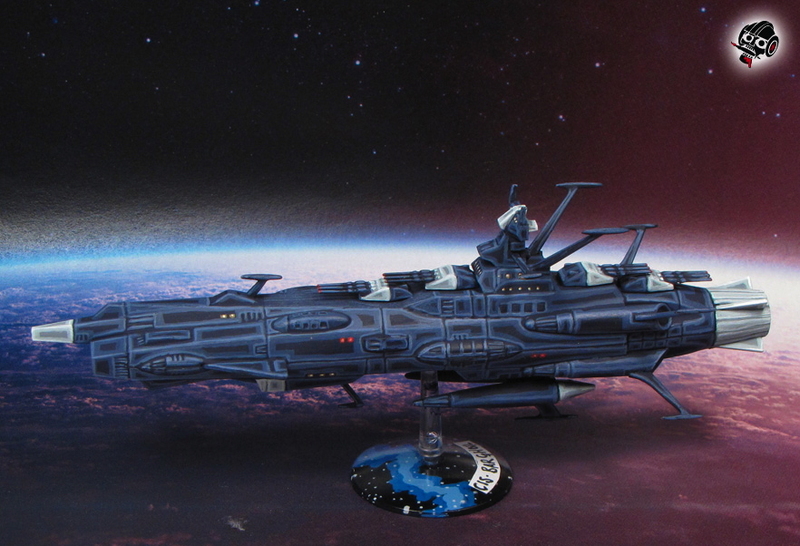 I really like the design, and I'm happy with the way the paint scheme worked out as well. A view down the collectors. I imagine they collect particles of some kind that are used for something in the mechanisms of the ship. 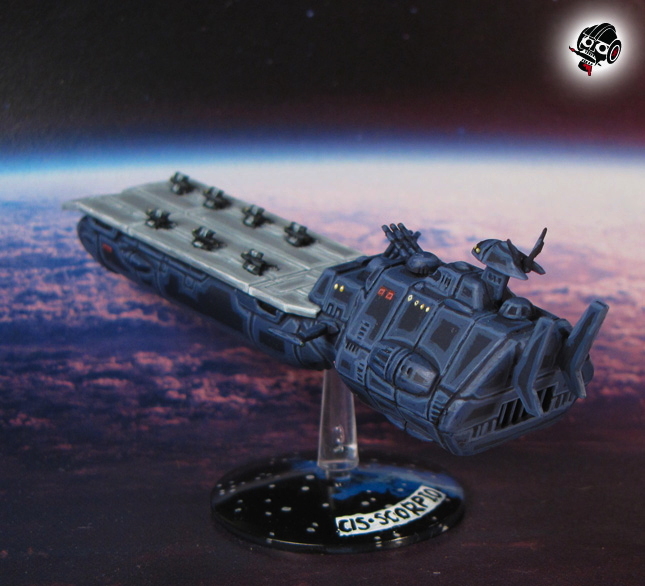 They add a distinctive flavour to the ship design. 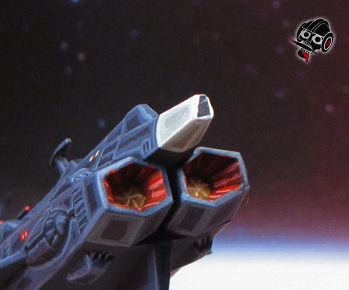 These ships are technically fighters, but Bandai made them out of scale with the ships, so they are huge. So I imagined them as fighter-shaped cruisers! They could easily be some of the only ships designed for atmospheric flight. 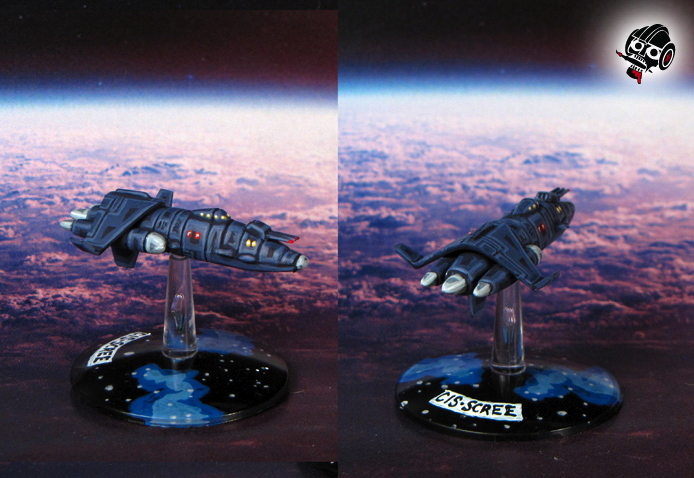 Another fighter-cruiser ship. 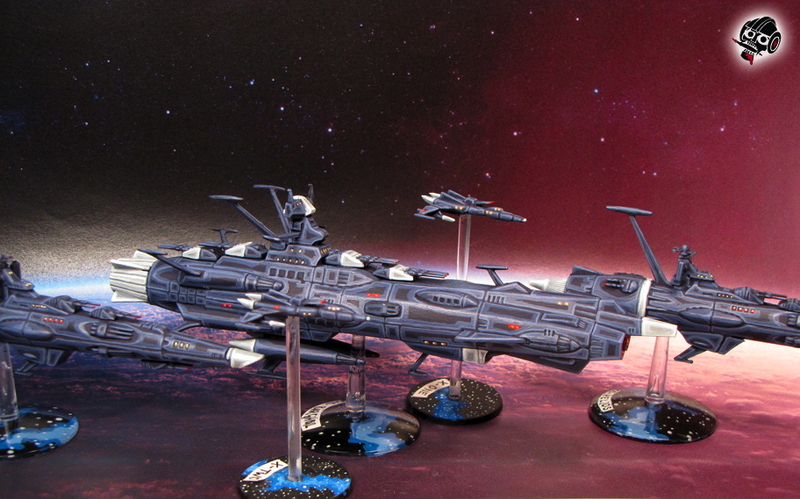 The more I look at these, the better they seem to me to play the role of a cruiser. 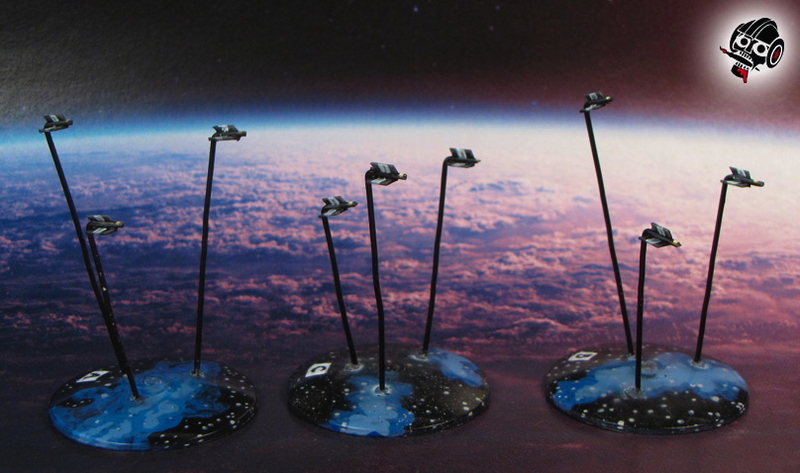 Here is a picture of the three latest fighter squads, along with the three previous ones. That should be all I need for fighters at the moment. A relative scale shot of the three latest ships with the destroyers from previously. I am pretty happy with the fleet so far! As soon as I saw this carrier, I knew I wanted it. 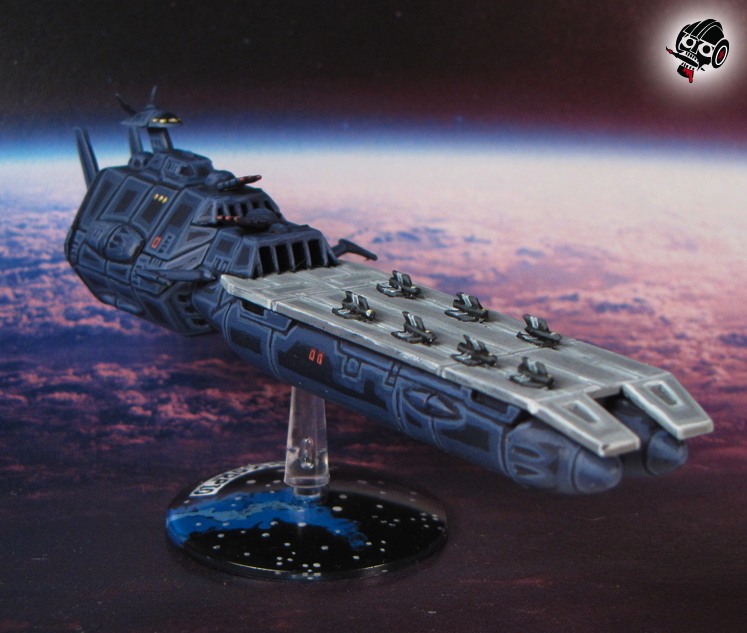 It is the perfect mix of modern naval carriers and space ships. I know that ships like the Galactica with their tubes are more common, but not nearly as cool! 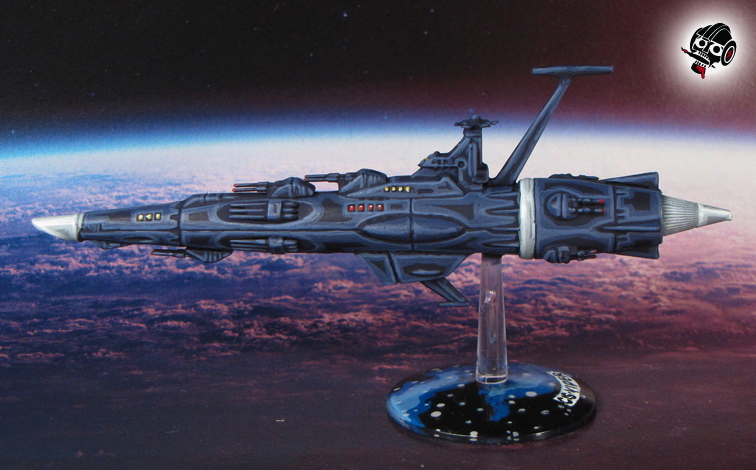 This ship is from the Star Blazers (aka Space Ship Yamato) universe, specifically the Gamilon Empire. I names this the CIS Scorpio, imagining those scorpions with many babies on their backs. I always fear the idea of those baby scorpions swarming all over... so I figured it was a good analogy. The fightes on there are scratch-build in a similar way to my arrows; I used a paperclip as the body and two fin-shaped pieces of thin card for the wings. 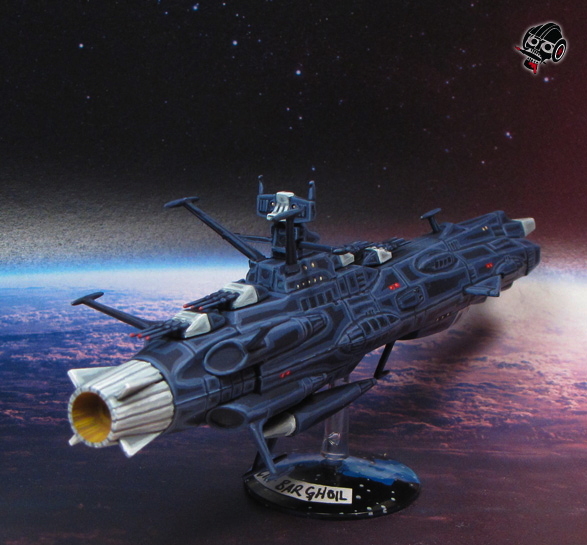 The colours are not standard Gamilon colours; I decided to do my own thing after seeing the Yamato shows and realizing that aside from the ships, I don't really like it. 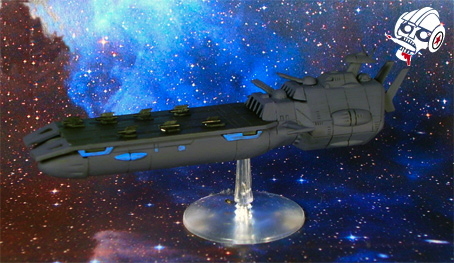 This is a small Earth Defence Force (EDF) destroyer from Yamato/Star Blazers. I really like the sleek shape of these ships, very compelling. Here's a head on view. The detail on these is pretty nice as well, with the little fins and wings. It really gives the impression of scale without losing the great details that don't come through in most metal space ship kits for miniature gaming. 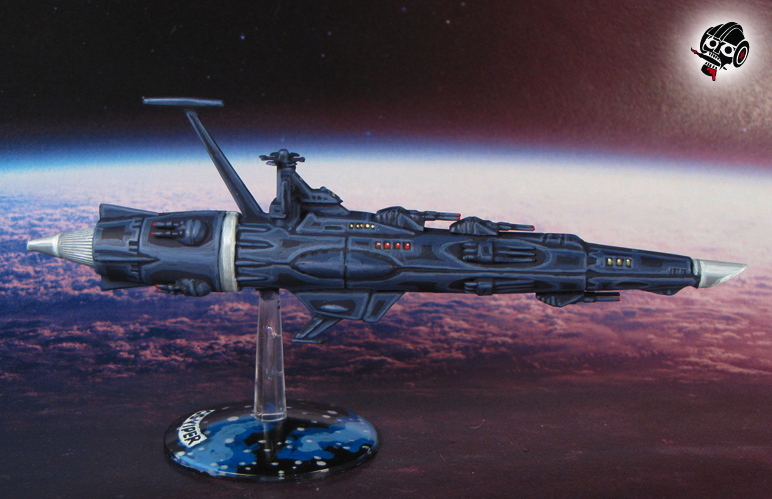 Here is a side-view of the same ship shown previously. 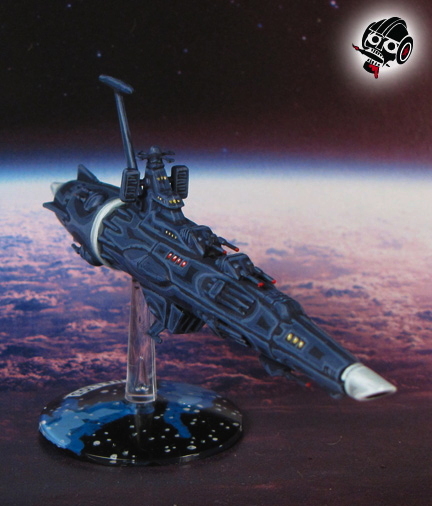 The CIS Helios. 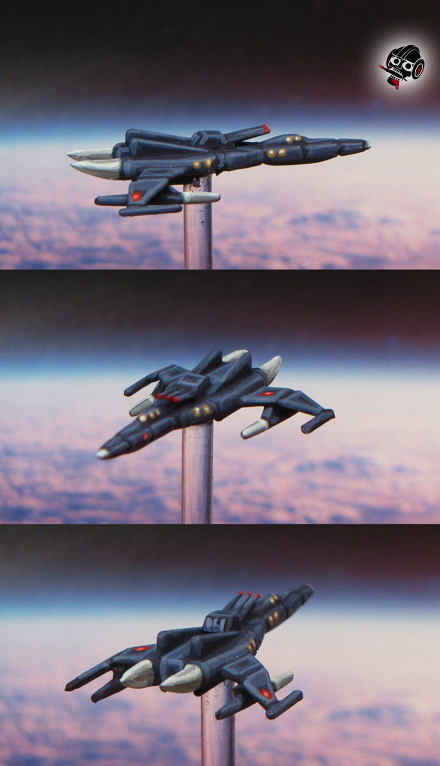 The CIS Viper, same class as the Helios in the previous three shots. I painted this one exactly the same as the previous one. 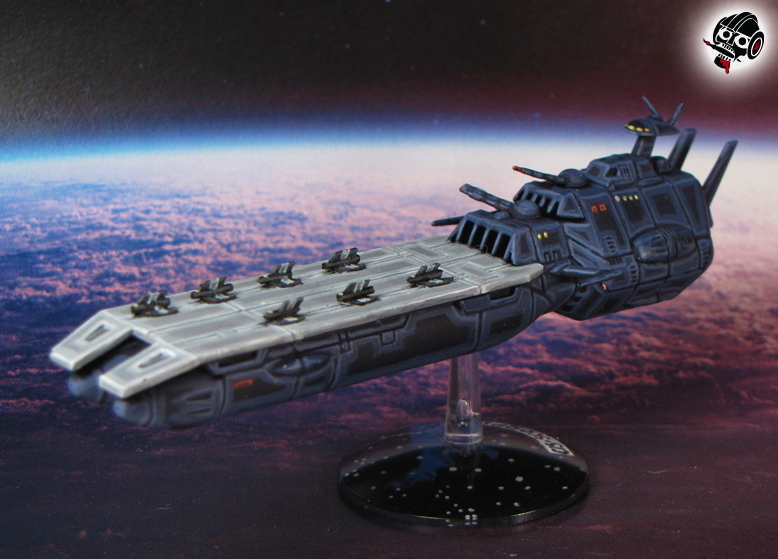 The length of this ship is definitely a battleship size in Battlefleet Gothic, but it's quite slim, so I intend to use it as a destroyer/cruiser class ship. 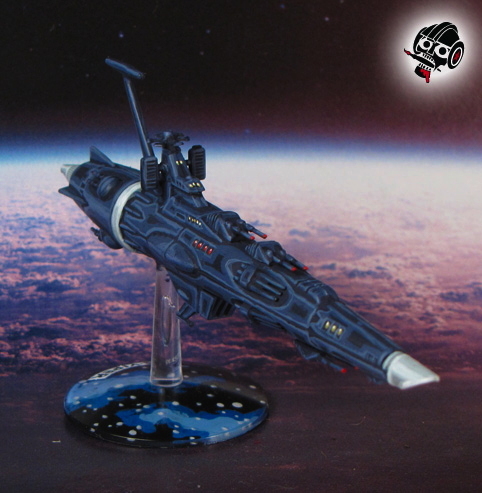 The CIS Viper, ready for action! 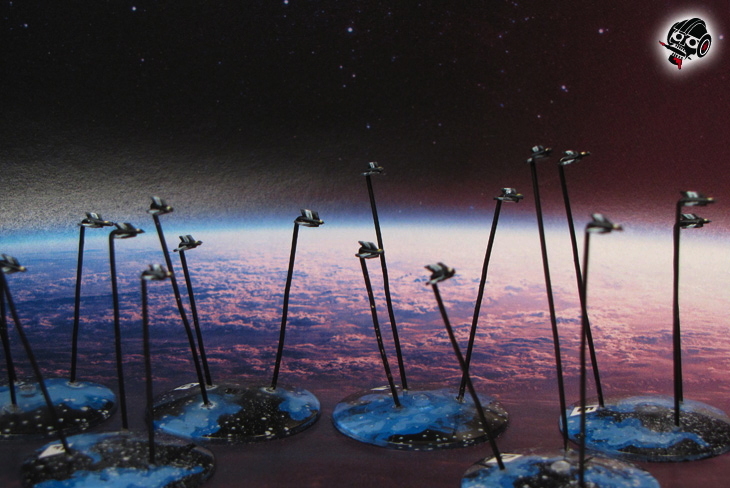 On this one I actually painted each of the stars on the base. All in all, I didn't like the look as much as the splattered stars, so I switched over to that method. This little ship came with the Gamilon carrier. 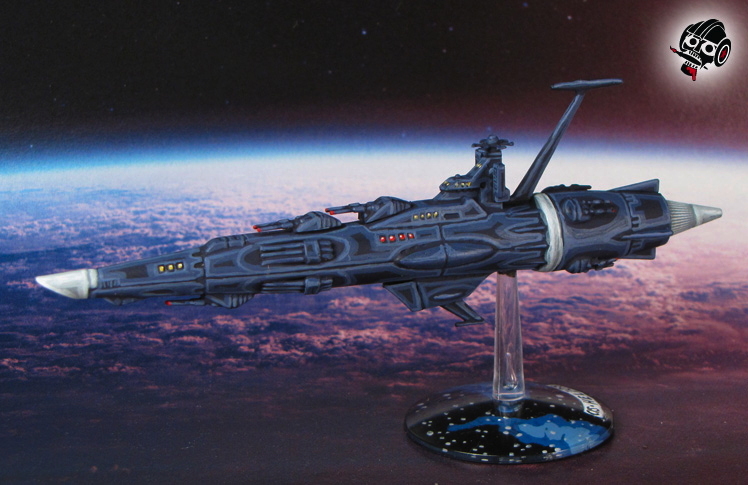 I imagine it's a fighter, but scale wise it's a frigate! Way, way too big to be used in scale... So, I put a gun on its nose and painted it up! I'm happy with it, even though it's a little cheesy. I built these using tin card for the fins and paper clips for the bodies. I was planning to buy some fighters, but these are cheaper and easy enough, and I'm pretty happy with how they look as well. The fleet as it stands at this point. Two destroyers, a small carrier, and a frigate. 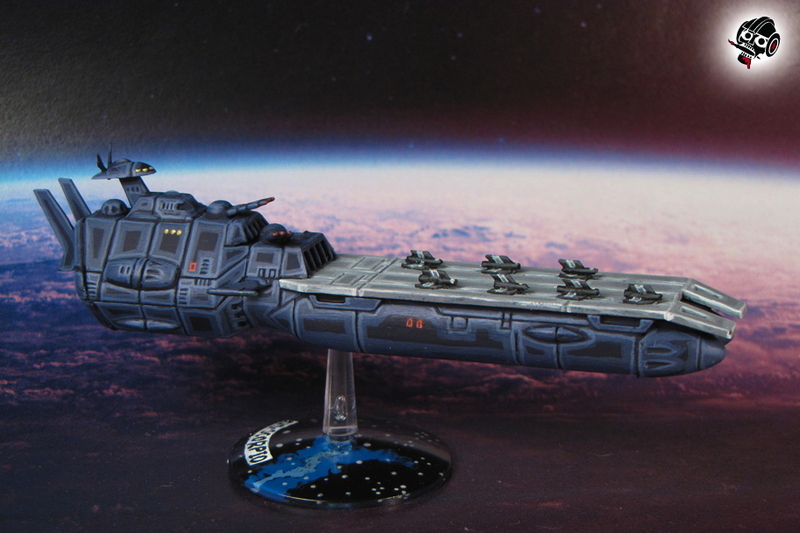 Here's a picture of the work-in-progress Gamilon carrier before I decided on the final scheme.